BFI develops leadership and farm management skills in beginning farmers and additionally encourages them to apply those abilities in their community organizations. Farmers Union employs educational sessions, business tools and professional speakers in a structured setting that includes on-farm experiences and tours of cooperatives. Application deadline for the next class is April 30! Kansas Beginning Farmers Coalition engages and informs beginning farmers and ranchers through online resources. Online resources including this website, our Top 10 and Monthly Harvest e-newsletters, and the KBFC forum on Google Groups. KBFC encourages producers to explore innovative production, management and ﬁnance strategies. Bringing together farmers of all experience levels for tours and farm days–key sources of inspiration and knowledge transfer, and by providing informal mentoring opportunities. KBFC empowers farmers and ranchers to seek solutions to our shared opportunities and challenges. Establishing working groups to explore opportunities such as cooperative equipment sharing, LandLink programs, and group purchasing. And by advocating for state and national policies and programs that support beginning farmers. Founded in 2012, KBFC is a statewide, grassroots (soon to be) not-for-profit organization working to engage, encourage, and empower beginning farmers of all ages. The first ever KBFC state meeting was held in November 2012 and things really took off from there. Regular e-newsletters, Facebook page, and list serve help to keep farmers connected and allow for the opportunity to share information and ask questions. With support from Farm Aid we’ve offered farm tours and field days, a listserv and eNews, as well as advocacy training. 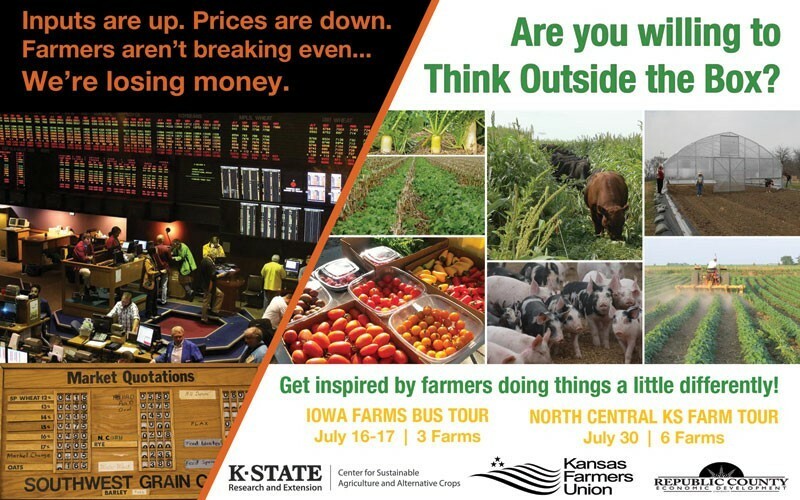 IT’S A GREAT TIME TO EXPLORE OPTIONS WITH AGRICULTURE! Visit 3 farms with decades of experience leading the way in innovative production and marketing strategies. Visit 6 farms producing & marketing directly to consumers. From the Farm to the Fork! 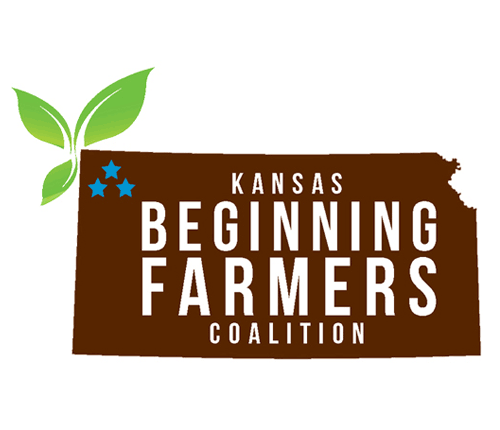 Kansas Beginning Farmers Coalition is member-based and farmer-driven. Become part of our network today! You’re busy; we get it. Let us sift out the chaff for you. Only the most relevant workshops, webinars and resources. Delivered to your inbox. Do yourself–and us– a favor & Subscribe Today! KBFC has a listserv just for you! Whatever your experience level, our Google Group provides a forum for questions, research, events, stories and more. Contributions by all farmers are valuable so click on over and JOIN US TODAY! Be in the know about beginning farmer events, issues and efforts statewide. Mixers, farm tours, policy efforts, profiles…you’ll find it all in the KBFC Monthly Harvest. Sign-up today! WHAT ELSE? The Best Encouragement Around! We work to encourage socializing, networking, and skill sharing among beginning farmers across Kansas. But that’s not all, KFU is launching a campaign to increase awareness among current KFU members of opportunities to support and mentor beginning farmers and maximize the development of relationships across generations, experience levels, and crop/production types. Visit our farms and discover how we do things and why. Learn from us! Gather at KBFC regional Meet and Eat potlucks. Get to know us! Learn from experienced farmers. Attend our great workshops! Kansas Beginning Farmers Coalition is celebrating our fourth birthday by honoring those that have nurtured beginning farmers across the state with the Sprouts Salute Awards. But we need your help! KBFC invites YOU to nominate the organizations, individuals, businesses, and beginning farmers that have supported you as a beginning farmer, contributed to your business successes, and helped to minimize your challenges. Make your nominations by Tuesday. We’ll then compile all nominations and the top five nominees in each category-nine in the beginning farmer category-will move forward to the voting process this week. Kansas Beginning Farmers Coalition recognizes the amazing work of the National Young Farmers Coalition (NYFC). NYFC is a national network of young and sustainable farmers organizing for our collective success: we’re defining the issues that beginning farmers face, fighting for the policy change that we need, and bringing farmers together in person and online to learn, share and build a stronger community. Join the movement at www.youngfarmers.org. Farming must remain a desirable and profitable career and livelihood. The healthiest future for food and farming in the United States will be achieved through the continued support for independent family farms that own and operate their own land and businesses. An interdependent network of family farms is the key to maintaining a resilient farm sector and healthy rural communities. As caretakers of the natural wealth of the nation, farmers must be conscientious and mindful environmental stewards. We encourage farming practices that sustain healthy soil, water and air, and that will protect our climate for the next generation of farmers and consumers. There must be high-quality farmland that is affordable for full-time farmers to purchase. Farmers must own their farmland in order to make capital improvements on their farms and to build equity for long-term financial security. Owning land provides personal satisfaction, confidence and practical efficiency that only comes with being in full control of the means of production of the farm; however long-term leases for secure and affordable farmland tenure must also be available. Farming is deeply satisfying and joyful work that should allow each farmer to fully utilize his or her innate talents and abilities. Farmers should have the opportunity to be part of a community working toward the common goal of sustaining farming for the future. All farmers and farm workers should receive a fair wage for their products and work, and should receive proper care when sick or injured. We recognize the incredible contribution of immigrant and migrant farm workers working in the United States, and believe that these individuals deserve the utmost respect, fair compensation and opportunities to build their own farms. Farming cannot be learned entirely in a classroom, and the best teachers are often farmers themselves. We support the apprenticeship model of farmer education, modeled after other trades, and believe that mentorships and alternative farmer-to-farmer learning opportunities should be available to young farmers. We strongly support inclusiveness in the farming profession, and believe that diversity among farmers is critical to maintaining a strong and vibrant agricultural sector to provide for a diversity of consumers. We reject divisiveness between farmers over production philosophies or any other issue. For land, skills and place-based knowledge to be transferred to the next generation, young farmers must embrace and collaborate with their elder farmers. There are too few farmers in our country, and as such, each one contributes to feeding our nation and upholding farming traditions.